I've been playing Sunday morning hockey over the last 3 summers and have only been out to eat after once. Honestly. What a waste. Think about it, a large group of hungry individuals probably in need of restaurant food... Hmmm... I take advantage of being on several sports team as an excuse to eat out, why not this group as well! So while changing out of my goalie gear, I overheard JuJu craving Pho. Hey, that's my kinda talk! I immediately invited myself to the conversation and even offered up a suggestion. There were a few places mentioned with us finally settling on Le Do, which was nearby. 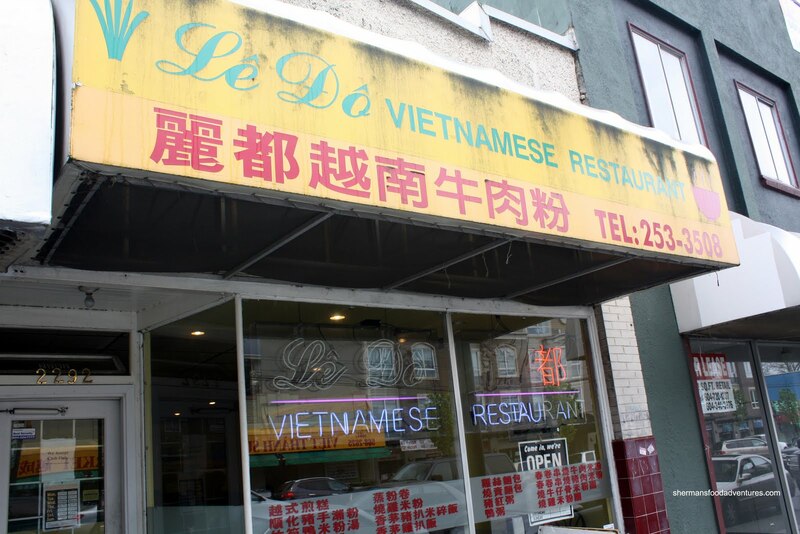 Since I'd never been to Le Do before, I accidentally walked into the diner on the corner and sat down (there is Le Do signage on the building). I was thoroughly confused to see the absence of srircha and hoisin on the tables. I asked if they served Pho and the server told me it was a few stores down. Sheepishly leaving the place, I went to the right restaurant. 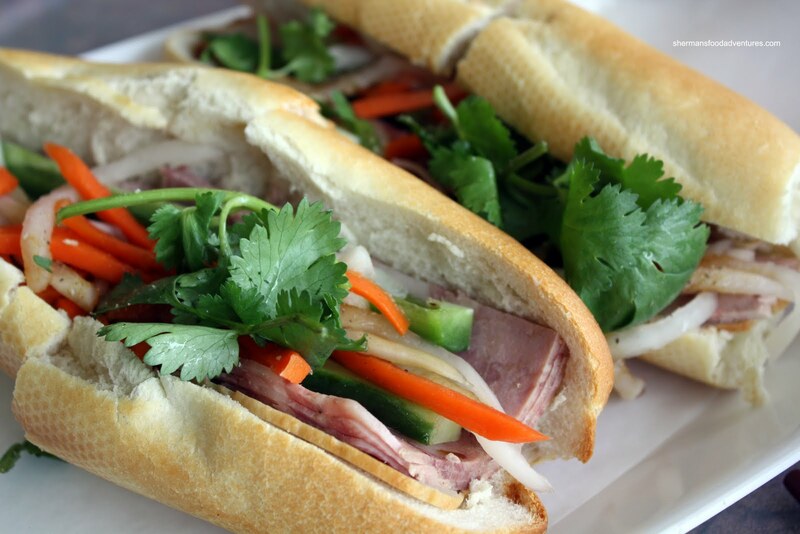 Ultimately, all of us decided to get some Banh Mi to go with our Pho. I went for the cold cut which had a good amount of meat. On the other hand, the meatball sub had so little filling, we thought they had fo rgotten it. Upon further digging, we found it underneath the daikon and carrots. 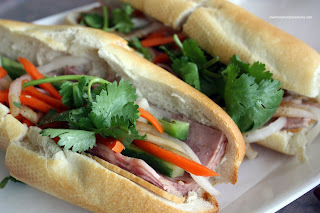 I was so hungry after hockey, I devoured my banh mi without looking closely at it. Either it had none or very little pate since I couldn't taste any. The bread itself was quite dense and not very crunchy. Definitely no where in the same class as the ones from Au Petite Cafe. As for our Pho, we all went for different ones and predictably, I went for the one with everything. I really liked how the soup was steaming hot. That is very important when there is rare beef and cold sprouts going in. 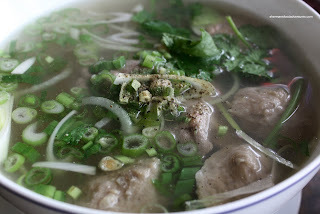 Moreover, the broth itself was both aromatic and not too heavy (as in salty or msg). We thought it was a good balance of sweet and savory. With perfectly done rice noodles and a decent amount of tender meat, the Pho is definitely above average here. 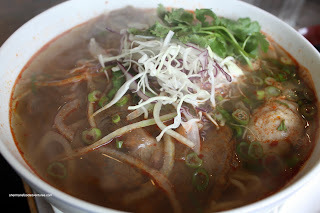 Kaiser Söze had the Spicy Pho and although it had all the good elements of the regular Pho, it was not really all that spicy. If you look at the picture, it doesn't even look spicy. I guess when ordering, it would be prudent to ask for it to be spicier, or better yet, just order a regular Pho and dump loads of srircha into it. Prior to ordering, I had called Viv and asked her if she wanted anything. With confirmation, I ordered her a Chicken, Shredded Pork and Egg Pie Rice. If you're wondering why it's plated despite being takeout, it was intentional. Hey, plated food looks better in a picture than a Styrofoam container! 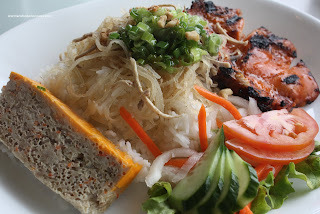 Viv enjoyed this dish and remarked that the egg pie (egg, pork, vermicelli & carrots) tasted better than it looked. If you are wondering where the shredded pork may be, it's the jelly looking strands on top of the rice. Yes siree, it's shredded gelatinous pork fat! Hey, it's good, don't knock it. And that pretty sums up the food here at Le Do, it's solid, if not unremarkable. But for the reasonable prices they charge, it's a good choice for Vietnamese food.